The worst thing that can happen to girl, India, is being dark when you have near white skinned mother, now to that add, straight hair, if that’s not enough a flawless complexion. Yahoo, as a teenager I used to think that the Lord singled me out for torture. Of course my valiant fellow sufferer was my brother Ramachandra. How we hated the diagnosis, Acne Vulgaris!! There were times he would tease me, by calling me, ”moon face” because I had crater size pimple scars. Anyway, it was not just pimples on my face, there were itchy, scratch, feeling on the back and there were small nodules. I thought it some kind of an allergy and my mother did not think much it. however when I did drape a sari, the blouse revealed huge eruptions. That’s when we went to Dr.Paremeshwar (He now practises in Shimoga.) the diagnosis was back/Truncal acne. 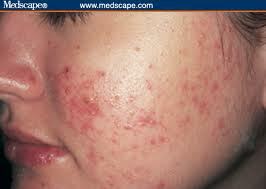 Of course acne vulgaris, is a common skin condition that is characterized by an area of seborrhoea, , papules and nodules. These occur on the face, chest, back and upper arm. 61% of the acne vulgaris is estimated to occur on the chest and back. This is essentially because of the activity of the oil glands. Eruptions occur wherever the oil glands are maximum. Treatment of acne is various, from home remedies, like quit coffee, and face packs there are a range of them. I don’t remember the foul smelling allopathic medications I tried. But one home remedy that did work for me was – a dry powder made of masoor, chana moong. This powder is mixed with milk cream and applied on the face. Of course talks about purifying the blood, with neem both for external and internal use. 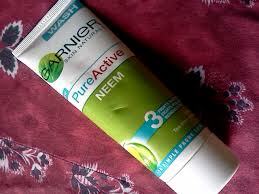 Neem is also used in general urticaria, controlling the eruption itch due to pox’s like chicken pox or allergy rashes. The concept of skin eruptions in Ayurveda is due to increase of Pitta, and Neem is Pittashamak, or destroyer of Pitta. Aleovera is another all time favourite of the Ayurveda doctors. Godakashta—or Jestamaddu is another cure. Tea tree oil is another great extract for skin eruptions. Actually a paste made of rose petals, jeshtamaddu, multani mitti if applied externally keeps the skin healthy. Handling the pimple scars tend to be an issue, particularly when they are on the back, though laser treatment is used these days. Particularly if there is pigmentation due to the scar. A combination of clindamyhcin and benzoyl peroxide or retinoic acid derivatives is often prescribed. In cases were resistance has been developed systemic antibiotics are used. Benzoyl peroxide soaps are used for bathing and salicylic acid peel is done in an interval of 15 days. Prevention of pimples may not entirely be possible. However it can be reduced with care. As soon as the first signs of pimple appears, using anti-pimple creams like retinol, and benzyl peroxide creams , or neem face wash and cream along with regular use of safi, can reduce the intensity of breakouts and subsequent scaring. If sever dandruff, or seborrhoea is causing the pimple then they have to be treated too. Application of ice or aleovera gel post laser treatment is important. Regular application of sunscreen is a must. Acne scars are called Atrophia Maculosa Varioliformis Cutis in medical terminology. These form due to excessive deposition of collagen or scar tissue in order to heal. This can treated with scar revision treatments like lasers. Written with inputs from Dr.Archana Gaonkar. ← On being healthy or sick.